I seriously think I'm losing my mind. I'd like to disappear til after Christmas. I made 1200 Pizelles this past week - no exaggeration. Either I need to quit sipping the Amaretto or stay outta the kitchen for the next few weeks. My brain is mush! Dale Smith was granted custody of his and Parker's three-year-old twins on Nov. 30. Smith had been caring for the children since Parker's disappearance, but on Nov. 29 the Florida Department of Children and Families placed the children under the protective custody of Parker's mother Yvonne Stewart. Parker's father strongly suspects Smith, who has so far refused to take a polygraph test, in his daughter's disappearance. Relatives have been careful to shield the toddlers from the news. When they saw the children last week, the family changed out of the "missing" T-shirts with Parker's face on them. "We wanted to act normal around them," says Erickson. "They think Michelle is at work, so they're doing as well, as you would expect. They don't know that she's missing." The situation is complicated by the custody issues surrounding the case. The twins are now with their father, Dale Smith – labeled by police as the primary suspect in Parker's disappearance. Last week, a family court judge ruled that, despite suspicions of Smith's involvement, the children could stay with him. Something is still bothering me about the day Michelle disappeared. Her 11 to son got home from school at 3:30, called his gmom when he couldn't find his mom in the home. So, was somebody else home with him or was he alone? I'm asking bc it doesn't seem like Michelle was in a rush to get back home by 3:30 for her son if she's dropping the twins off at Dale's at 3:18. The times just wouldn't add up no matter how many times we've tried, including using different paths. Maybe when Michelle's son called Yvonne, maybe it was at her shop that he called, but most of us just thought he called his gmom's house? Were they still living at Yvonne's? If so, with others living there, wouldn't there be a better chance of somebody being there for her son? IRS just bugging me why she wasn't rushing home but if she thought somebody was already there then that would make sense about the dropped of the twins so close to her 11 to sons afterschool arrival time at home. Right, so on the 30th they went back with Dale? I thought thet were only with Yvonne for 1 night? I took this off of auto correction then put it back. Everything looks perfect UNTIL I press post, then it's all corrected, which isn't correct at all. It's making me appear remedial & it's irking me to the extreme! To sb yo, tons of others. Sorry. 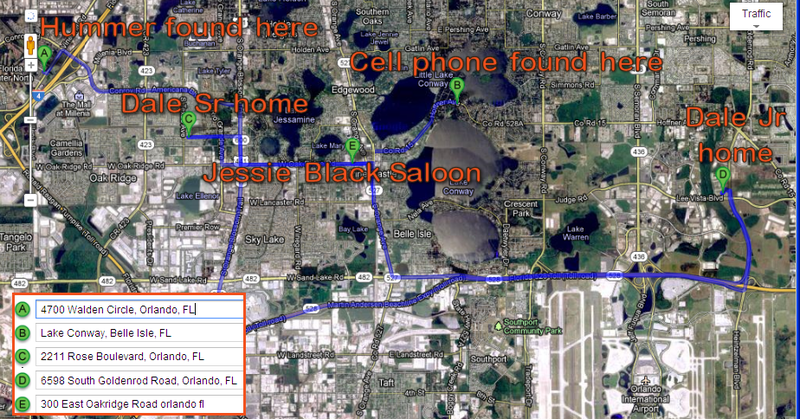 ORLANDO, Fla. -- A source close to the Michelle Parker investigation tells WESH 2 News that Michelle Parker's phone was found by a dive team in the Belle Isle area. The phone was found in the water beneath the bridge that crosses over Lake Conway, near an area where Little Lake Conway and Lake Conway meet, the source said. No worries here. I have faith as it happened to me last summer. Like I said in a previous post, it's a bit tricky but an iPhone4 is like no other phone out there. It'll take a little bit of time but the info they uncover will be worth the wait to do it right. Kudos to the dive team! Just wondering why there is dirt on the phone when it was in the water????? Did LE drop it??? This is not making sense to me.